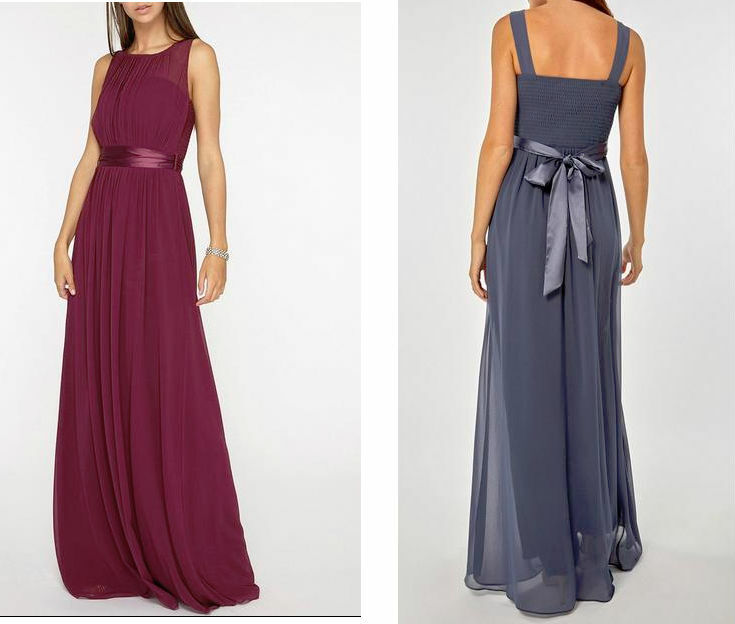 This bridesmaid dress comes straight from the high street, costs under €100 and comes in two colours. There is absolutely no reason to spend the big bucks on a bridesmaid dress. I'd go as far to say it's madness to spend more than €100 on the dresses your 'maids will only wear once. No, they won't wear it in the future to a ball. Who goes to balls? And they won't wear it to a black tie occasion either. Why? Because it will look like a bridesmaid dress. There are brides who won't buy bridesmaid dresses at all but dresses full stop. It's a modern move, but also a risky one in case they end up looking like your regular run-of-the-mill guest, but maybe that's the point? For my wedding, I freaked myself out by buying three dresses that cost almost €500 together. So, I found three online that ended up being €20 each because I caught them in the sale and gave the original, not as nice, dresses back the next day. They weren't bridesmaid dresses at all and they were knee-length, but they fit in with the feel of the wedding and the look of my dress. If you're on a tight budget, like I was, you don't have to almost have a panic attack, like I almost did, when choosing your bridesmaid dresses. This one from Dorothy Perkins, which also sells purse-friendly wedding dresses, will look familiar because it looks like every winter wedding bridesmaid dress ever. And it costs only €85. I'm talking about the mulberry coloured dress primarily, although the grey would look nice this time of year, too. The floaty material will look good in person and in pictures, the style is forgiving on a pregnant bridesmaid, or indeed, bridesmaid of any shape and size. I love the chiffon bow that ties on the back. And you'd need to do hardly any tanning at all. Have you been a bride with a bridesmaid dress dilemma? How did you solve it?